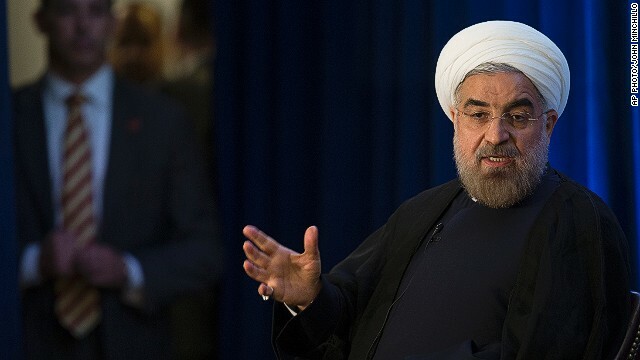 "But only because the Iranians have indicated for the first time in a public document that they are prepared to accept rigorous monitoring and limits on level, scope, capacity, and stockpiles," the statement added. Meehan cautioned the administration's agreement to any limited enrichment program in Iran applies only to that nation's peaceful energy "needs" and does not amount to U.S. recognition of an Iranian "right to enrich." The White House statement was in large part a reaction to questions raised about an international agreement brokered last month with Iran over its nuclear program. "We have accepted Iranian uranium enrichment," retired Gen. Michael Hayden, a former CIA director, told Fox News Sunday when asked about the deal reached between Iran and the United States, Britain, China, Russia, France and Germany. Meehan said any limited enrichment program in Iran would still be subject to the approval of those so-called "P5+1" nations. "If we can reach an understanding on all of these strict constraints, then we can have an arrangement that includes a very modest amount of enrichment that is tied to Iran's actual needs and that eliminates any near-term breakout capability," Meehan said in the statement. Asked about Iran's uranium enrichment ambitions, which the United States and others fear could lead to the development of a nuclear bomb, White House Press Secretary Jay Carney said President Obama believes Iran "has the right to peaceful nuclear energy." "What the President has also made clear is that he is adamantly opposed to and will not allow for Iran to acquire a nuclear weapon, and that is the threat that has been posed by Iran's nuclear weapons ambitions," Carney said. give the muslims what they want–we all know like obama they won't lie. Yet another bonehead idea from this admin. You cant make this stuff up. What an embarrassment this potus has turned out to be. Oh well now that is not good. Who makes agreements with terrorists? Hu-Sane in the WH? Iran has an inalienable right to nuclear power. Yep, the One does it again! You can fool Democrats some of the time AND all of the time! Obamacare and foreign policy in the toilet! For the first time in nearly 40 years, a majority of Americans believe the United States is less important around the world and that it should mind its own business, a stunning rejection of President Obama’s foreign policy just four years after he received the Nobel Prize. A new Pew Research Center poll found that 53 percent of people believe that the U.S. is playing a less important role as a world leader than a decade ago, the highest figure since 1984. Worse: 70 percent said that the U.S. is respected less than in the past, almost matching the high reached under former President George W. Bush, whose foreign policy Obama pledged to reverse. Lovely. Just lovely. Why don't we also hand them some bomb casings and JDAM GPS guidance systems while we're at it? Enough of this failed administration already. Just enough. "If you like your enrichment program, you can keep it"
Sorry Barack, I think Iran knows better than to trust you. The President who gave Iran the N-U-K-E!! This will open a whole can of worms. Who else in the middle east will now want to enrich that has not been allowed to. The middle east has always been like a powder keg, this president is letting them really pack the powder in the keg so when it goes off it could engulf the entire world. It is nice that the Iranians accept that they need to cut down on the high level enrichment. The question is about enforcement and verification. Who is doing that? What are the consequences of not following the agreement? I'd like these answers. If you like your nuclear weapon development plan, you can keep your nuclear weapon development plan. Period. The Iran regime claimed that the agreement in the White house Web site is not real one?! Who is saying the truth about the agreement? Can we run to compromise any faster than this...We don't even have a framework for an agreement and our biggest bargaining chip is being passed to the opposition. great negotiations so far.